Having recently read Eat, Drink & Be Merry's excellent post "An Evening of Elegance, Affluence and Taste", where he catered a lavish dinner for a wealthy family, I felt this was as good a time as any to write about my 99-cent Ikea breakfast. Yes, the plate of scrambled eggs, fried potatoes, and bacon shown above set me back $0.99 ($1.07 with tax) at Ikea; served on real Ikea china with real Ikea silverware! Now I know that anything that costs $0.99 should be immune to criticism. I mean, it costs $0.99 for crying out loud! 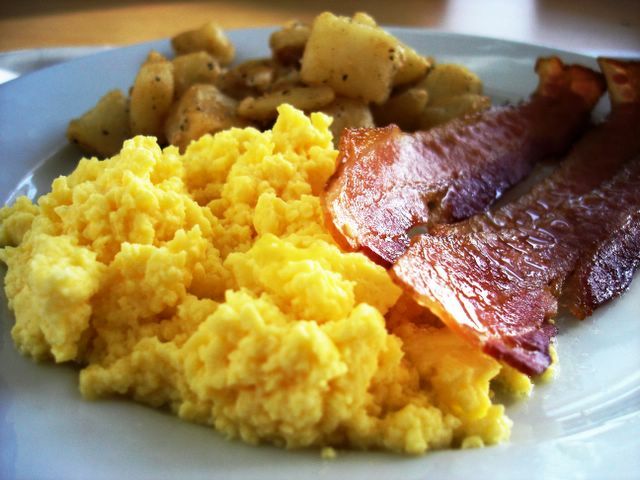 But being that I review restaurants on this little blog, I feel obliged to tell you that the eggs, since it's served from a heated trough, were overcooked to tight little curds resembling cottage cheese. But the bacon was crisp and the potatoes tasted like good old home-fries. In any case, all shortcomings of my bargain-basement breakfast disappeared when I doused it with a few scorching hits of Tabasco. And as long as I'm being honest, I also must confess that I had to buy a second plate to fill up. But if you're feeling like a big spender and you just cashed in that winning Lotto ticket, you can order the Deluxe Breakfast for $1.99, which will add Swedish pancakes with lingonberry compote and a cup of coffee to what you see above. It's all obviously a marketing ploy to lure customers in to shop for their assemble-it-yourself Swedish furniture; but if you're going to eat breakfast on the cheap, you could do a lot worse. So if you're like me and you gravitate towards the 99-cent value menu when you find yourself at a fast-food joint, your inner cheapskate will rejoice when you feed it an Ikea breakfast. And oh yeah, unless you brought your own butler to Ikea, don't forget to bus the table when you're done. Hi Elmo - I've always thought that the reason Ikea needed to have a restaurant is to feed all those customers who are either unable to find the exits, or who are ready to drop dead from exhaustion. Man, I always wondered about the giant "99 Cent Breakfast" sign. Good to know they provide good ol' Tabasco which makes anything palatable. Elmo Monster, I love it when you review a place that fits within my budget! (See Elmo's Previous Hong Kong Fishball House post.) I've eaten at both Ikea restaurants: (1) the indoor restaurant that serves Swedish meatballs and lingonberry juice, and (2) the downstairs Costco-like hot dog and cinnamon bun joint, and I gotta tell you that Ikea's food places fit the budget (my few coins in my pocket) and fill the empty stomach! Hey, those hot dogs are only $0.50! That is a great deal! Oh you are so right! You need a compass and a sherpa if you wanna get out of Ikea without going through their preordained path. 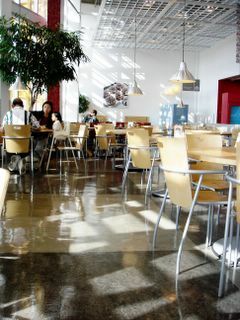 At Ikea Costa Mesa, the restaurant is at "the beginning" of the store. The hot dog counter is at "the end"...fuel up for pre-shopping and sustenance for afterwards. Yep...I'm not sure how much I would have enjoyed that breakfast without that trusty bottle of Tabasco. Those pancakes *are* delicious. Nutty, chewy, and light. I'd pay $1.99 for those things by themselves! Glad to see you posting again! Agree on the hot dogs. Even the Manager's Special on the 15 meatballs is a great deal...includes bread and soup! Since I'm rattling off what other things I like, those soft serve cones for $0.99 are gooooood! And oh yeah, the Daim Torte is pretty awesome too. I can't believe you just reviewed Ikea's .99 breakfast! HAHAHAHA I love it! Do you know what is the best thing at Ikea to eat though? The non-fat frozen yogurt down stairs at the hot dog stand... it's only a $1, too. Anything serving food is fair game to me! And I like that frozen yogurt cone too. Ikea should put up a drive-thru. I think I walked five miles the one time I went there for breakfast just trying to find the kitchen area. I think the signs they had pointing to the kitchen area were also meant to send you on a wild goose chase. The food I got was good for 99 cents and my eggs were acceptable. It might depend on how soon you catch them after they make a batch. Might go back again sometime and add the pancakes. Elmo, nice review. I've eaten at the Ikea in Tustin once and it just felt very.... odd. I know they make the meals so cheap b/c they want you to sit on the Ikea tables and chairs and think ... "Hey you know what, these chairs aren't bad, let's go buy these. Look there's the name and price of it right there." At $.99, you can't complain even if it looks like it was made by Southwest Airlines. I'm surprised they didn't have their own brand of tabasco, like Tabasko. Those pancakes are well worth the finding your way through the maze. Okay, may not as much as the restroom when you have to go. Now you're thinking like those marketing geniuses at Ikea! I am one of the rare and few individuals who go to IKEA solely for their food. After numerous furniture fiascos due to the cheap shoddy construction and quality of their home furnishings, i swore i would never buy another piece of furniture. But as for IKEA's food- I have no issues for complaint..... yet that is. I have yet to try their breakfast, but I have a penchant for the "manager's special" of 15 meatballs, 2 red potatoes, cranberry sauce, and your choice of a cup of soup or small salad. It also comes with a drink. Who can resist a complete 5.99 meal of delicious swedish meatballs? I'm certain you've tried their meatballs elmomonster... whats your take on them? Their Swedish apple cake is very tasty, too. Speaking of shoddy furniture, did you know that ikea pumps air into the particle board to give it volume/weight. i watched some special on nat'l geographic about it. Good thinking, that'll last you a good 2 years. I'm sad that Ikea moved from Tustin to Costa Mesa. I go there only once a year instead of...three times a year. haha. I ate breakfast at the Costa Mesa one and it was ok. 99 cents...needed Tabasco too. I think i actually drenched it in ketchup too. All right, elmo. Now you have done it! I had the new IKEA in Tempe, AZ on my list to review. LOL. Ours has the Swedish pancakes, and they have Chicken Marsala for one of the lunch or dinner entrees. By the way, I'm looking forward to your Ikea review Seth! Don't forget the other 99 cents special - the kid's meal!!! It comes with a bottomless drink and a PRIZE!!! Holy krap, now that's a deal! C'mon, do your next review as 99 CENT and rap the whole thing. If you can haiku, then you can bust a rhyme. Peace! I think the fact that I can haiku negates my gangsta creds! It's totally pointless for Ikea to have a restaurant. I don't need to eat when I get there, and by the time I finally escape from the store, there is no way I'm going to hang around one second longer, wait in another line, or spend even another 99 cents, no matter how hungry I am. If they served those potatoes in the main checkout line though, then maybe I'd eat some (or be pissed that I was forced to smell and therefore buy food). Where can I get the recipe for Ikea's Swedish Apple Cake. My friend goes there every chance he gets to get a piece. I would love to surprise him for his birthday and make him one. Thank you. All these months later, I have to add that the Swedish Apple Cake with Vanilla Sauce is outstanding. I recall stopping at IKEA Costa Mesa circa 2004 for a quick bite en route to LAX to catch a red-eye flight, and enjoying a slice of the cake for dessert, with the vista of 405 Northbound traffic in front of me via those big windows. Well, this comment's a little late, but I just wanted to mention that I love eating at Ikea. I live to far from any Ikea to do that conveniently now, but when I lived near one in Canada I got an Ikea credit card to use at their restaurant. I just used it to get the restaurant discount, and I never used it to shop since the interest rate was 28%. I also go to Ikea to eat breakfast all the time. Its not the best breakfast I've had, but its certainly the best I've had for 99 cents. My only complaint is they're opening their restuarant later. Before, you could buy food before the rest of the store opened. I would drop in, get some breakfast, and then go complete the rest of my chores. But, now, with this new operating hours, I don't know if I can do it anymore. the 'Ballerina' brand cookies by the checkout registers are delicious! I may be the cheapest date out there. I love the Ikea $.50 hot dog...does that make me a bad/kinda gross person? Personally, I don't think so! Keep up the munching, we'll keep eating! emergency exit arrows on the floor. their way out in an emergency. My wife and I did the 99 cent Ikea breakfast at this location once. It was enough. My wife had the same problem with the eggs that you did. I do love the meatball dinner, though. That lingonberry sauce gets me every time. Mmmm. And I agree about the frozen yogurt from the downstairs snack stand. That's good stuff. I like their chocolate cake. And the swedish meatballs with gravy and lingonberry sauce? That gets a thumbs up from me!